I just returned from a Tango lesson here in Buenos Aires with my wife and son. It was much more challenging than I thought it would be. My back was pouring with sweat. I love challenging myself with new things. I’ve learned never to get “too” comfortable with life. Upsetting the balance of ourselves helps us to grow. I have always considered myself a person who loves dance. In learning the Tango I kept wanting to put some more body parts to work, hips, knees, torso, etc. and I kept getting warned by the instructor to stiffen up. To me, stiffen up and dance don’t ever belong together LOL. It was only an hour but I really felt challenged. I am proud of my wife for obliterating her comfort zone for me. My son helped by shooting a lot of video and taking a ton of pictures but I’m not sure those will “ever” see the light of day. I really wanted to Tango because of the African Ancestral roots of the dance. 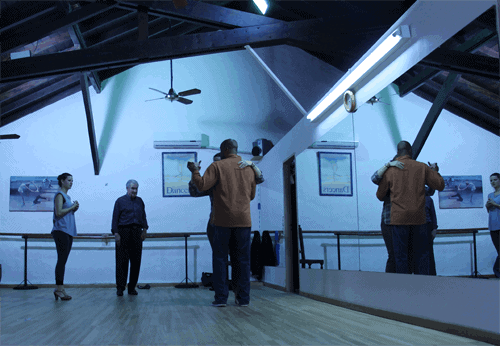 I’m all about connecting with my ancestral lineage and I thought learning the Tango in Argentina would be a wonderful experience. It was! I’m not sure if I’ll ever go back for another lesson but I have a special memory now that I’ll treasure forever. I learned to dance the Tango in Argentina!